Tooth damage is a very common problem that most children come to us for. Caries, spots, broken teeth and browning are often seen in children as little as two either due to bottle feeding, drinking juices or lack of frequent brushing. Parents often notice these on general observation. While cleaning of the teeth and removal of caries is what we generally do as the first intervention, occasionally it becomes necessary to use crowns if there is significant damage to the teeth or when pulpectomy is done on children after discussion with parents. Among the various kinds of crowns that are generally used, Zirconia crowns are popular with most children & their parents for several reasons. A popular all-ceramic crown, zirconia is used to correct damaged teeth or cover disfigured tooth. They last long, are durable and long lasting. Most importantly, they are translucent and have the appearance of natural teeth. Zirconia is a material that is very compatible with the human body. It isn’t rejected nor does the body display allergic reaction towards it and is safe for years. The crowns are translucent and very close to teeth color. Because it needs minimal preparation, there is much of the teeth that can be salvaged. This is also helpful in case the crown needs to be removed at any stage. Zirconia crowns are fitted just like a regular crown. There is a stage of ‘preparation’ where the teeth are assessed and measured for the placement & cleaned, and the stage of ‘fitting’, where the crown is placed over the teeth and cemented into place. 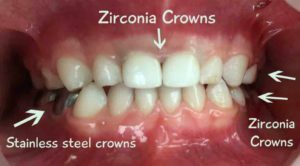 To learn more about Zirconia crowns and whether they are a good option if your child’s teeth are adversely damaged or caried, reach out to Dr.Premila at Small Bites by calling 080 4125 6715.